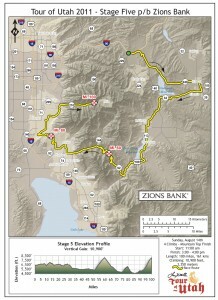 Start: The signature “Queen stage” of the Tour of Utah is Stage 4 presented by Zions Bank, and it will be worth the travel time to jump around on this course for multiple viewings. Start in Newpark area of Park City. Mile 10: Blaze ahead of the peloton and watch them crest the first of many climbs today. With Jordanelle as the backdrop, this is one great photo op! Mile 32: Using the farm roads, get ahead of the caravan again and make your way to the second Hot Spot sprint of the day in Midway where the town will be partying! Mile 56: Although just about any spot along this scenic byway called Alpine Loop will be wonderful viewing, the KOM is prime viewing and has plenty of parking and a rest room to boot! Mile 76: The top of Traverse Ridge in Draper will surely draw big crowds and great cycling; expect the top guys to fly over this climb in the big ring! Mile 87: If you don’t plan to drive to the finish, this little bump in Sandy offers great viewing as well. Park on one of the side streets and set your lawn chair out on Wasatch and listen to the coverage on KFAN and there will be live web cast on the Tour web site. Mile 91: Don’t believe the sign. Tanner Flat is anything but flat. This is the steepest section of the climb to Snowbird and has quickly become the favorite viewing spot for the “Tour Fanatic”. Pack a lunch and fill a cooler, dress in costume and join the fun!! Finish: Snowbird Ski and Summer Resort is the place to be on Sunday, August 14 if you are a cycling fan. Be sure to head up before 2:00pm or face a closed road!